Sorry for not posting lately! My mom sent me this video and I cannot stop laughing! This guy’s laugh is hilarious! Yep, these are safer. ? 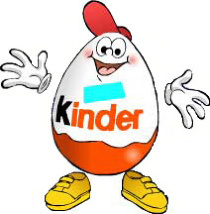 Someone explain to me, please, how a hard-shelled, cavity starting, teeth breaking, jaw dislocating, bigger than a child’s fist piece of gum is safer than a Kinder Egg? There’s no warning label for age or mouth size or anything. The only thing between a knuckle-headed kid and these dentist calling cards is a quarter. I can’t even look at the picture without my jaw throbbing. I want my chocolatey Egg. We’ve uploaded two video to YouTube highlighting the differences between the Ferrero Kinder Surprise Egg and the Ferrero Kinder Joy. The shorter one can be found here and the longer video here.